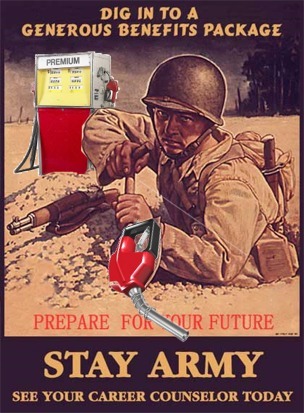 Instead of paying to educate returning soldiers under the old-school GI Bill, my GI Fill offers fuel purchasing assistance to veterans and their families. I believe that they have earned the right to get extra of the substance that they’ve risked their lives to protect. In addition, it would create Detroit saving demand for SUVs. Now that’s effective recruiting! If you’re interesting in the pre-photoshop poster. Want to lower gas prices? Advocate for energy independence! It’s not a shock that reductions in supply or increases in demand will increase prices. The strange thing about our current oil price is that supply is stable and demand increases are moderate (or at least predictable). So what is driving the price up? I don’t agree with this as a complete picture, but let’s blame “market speculation” just for the fun of it. There is some justification for blaming speculation – when China removed price controls, oil fell because demand would drop. Oil falls on news about major car makers converting from trucks to cars. Fundamentally, the THREAT of reducing demand is enough make the price of oil drop. If the US takes decisive action to reduce our demand for oil then the price would drop. I believe that oil rich countries would then be forced to take equally decisive measures to maintain our addition on oil. Unfortunately, with low prices we would again lose our conservation drive. There is a strong historical pattern of this type of behavior. Do we have the will power to finally break free of the Oil cycle? Oil prices up or down? Speculation driving them up? I believe that our government is highly motivated to find a short term fix to the supply problem. Inescapable election year politics lead me to predict that we’re likely to have an artificial/short return to low prices to stimulate the economy. I think this will have much more drastic long term costs. Alternative energy is the only long term solution . A price floor will protect investors in alternative fuels because real alternatives need time to reach the mass market. I’ll suggest again, that we should have a 10+ year “energy independence” initiative like the 1960’s space race where we invest heavily in building the expertise (the people) to solve this problem. Our nation benefited dramatically from that focus. A sustainability focus would regain maintain our world leadership. Yes, I’m a sustainability nut… Instead of frolicking the the surf, I was taking pictures of the beach trash cans at Fort Walton Beach, Fla, I was appalled, appalled I tell you, about amount of recyclables in the trash. While it’s pathetic much litter remains on the sand, I’m even sadder that the City of Fort Walton Beach (FWB) puts out trash cans in pairs, yet does not offering beach side recycling. The photo shows the obvious – typical beach waste is at least 80% recyclable! 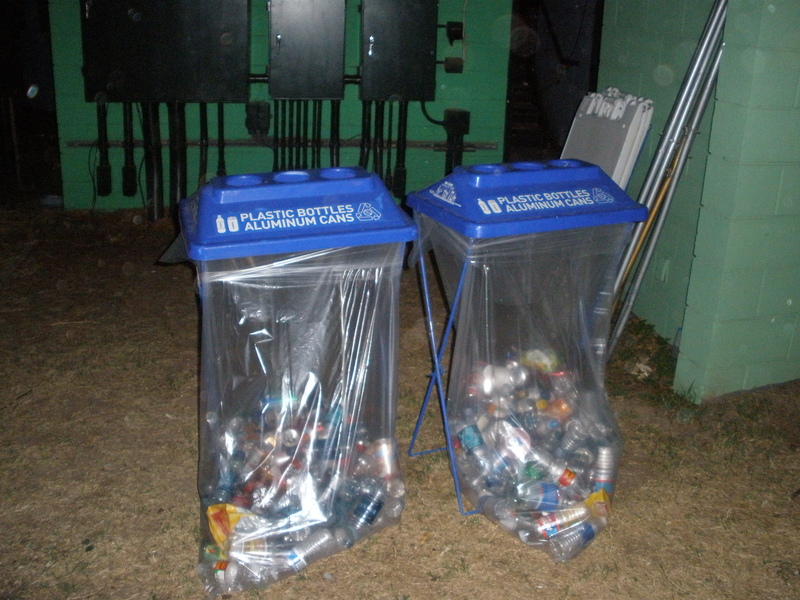 Does it make sense for FWB to provide beach recycling as a service? Would people use it if they offered it? Unfortunately, it’s not a viable service unless people will use it. I wonder if recyclers could handle the 20% waste in the otherwise Al & PET rich trash. 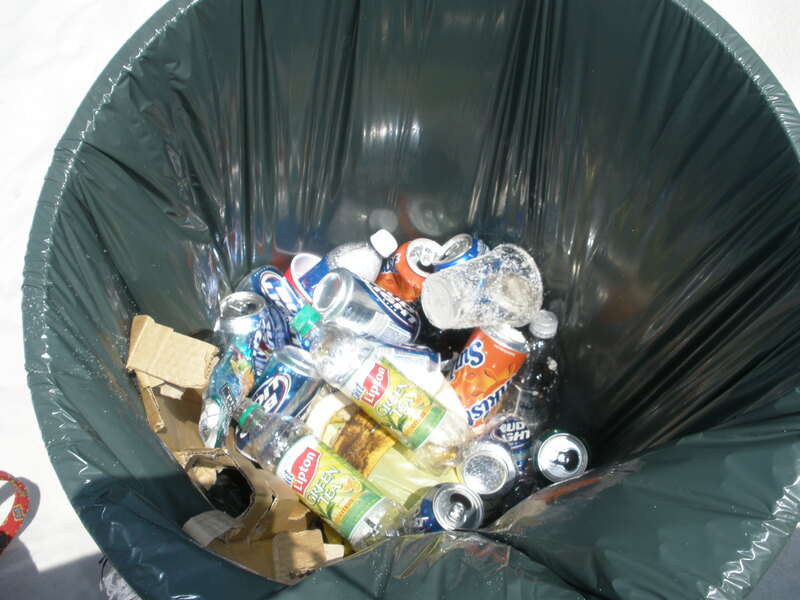 From the photo below, Austin clearly has both the motivation and participation to provide recycling. What will it take to push this municipal attitude to the mainstream? There is some very bad energy MoJo consistently coming from prominent Republicans (McBush & Gov Perry) calling our current energy situation a Crisis. It’s not – it’s our new way of life get used to it. Calling it a “crisis” is a transparent attempt to link us back to th 70s and the Jimmy Carter era. I believe that McBush wants us to hook that idealistic, but ineffective president to more recent Presidential hopefuls. The word crisis also implies that it’s a temporary situation that we can “fix” and then go back to our regular lives. Sorry McBush, but the days of wasteful consumption are ending. Welcome to the Age of Constraints.